The 147-year-old building severely damaged by fire on Friday has been home to shops, restaurants and a hotel. 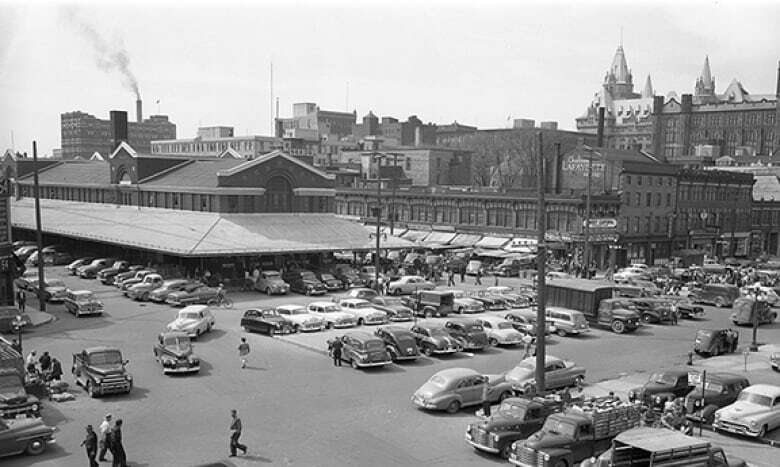 According to a city archivist, it has also perfectly reflected the changing ByWard Market around it. It's been home to bistros, a butcher's, second-hand shops, and before all that, the long-forgotten but no doubt storied Feathers Hotel. The old grey building at 35 William St. survived one fire that ravaged the ByWard Market in the 1950s, but fell victim to another on Friday, when roofers are thought to have sparked a blaze that heavily damaged the structure, along with three neighbouring businesses. The owner of Vittoria Trattoria, the popular restaurant that's occupied the building for the last 24 years, has now handed matters over to his insurance company. According to city archivist Paul Henry, 35 William St. is in many ways a microcosm of the bustling neighbourhood around it, changing as the market has changed. "It's a fascinating little microcosm of the vibrant market," Henry said. "It's a shame that such a building with such a storied history was damaged." The hotel faced the bustling ByWard Market building, the area's centrepiece to this day. The hotel closed in 1901 and the building underwent renovations, including changes to its cornice and brick additions to its rear. By 1912, it was home to the first of a series of second-hand shops, and was soon swept up in the changing demographics of the market. "[The market] had been built and originally occupied by the English, Irish and French ... between 1851 and 1878," Henry said. "But this part of the market gave way to Jewish settlement, and then later to a broader mix as other groups moved in." By the 1920s, William Street became home to Jewish merchants and a synagogue was built on nearby Murray Street. The shops that by then lined William Street sold clothes, furniture and Jewish delicacies. The shopkeepers and their families often lived above their businesses. Around 1975, Iberica meats moved into 35 William St., but by 1980 the building was vacant and remained empty for seven years. Then began the building's restaurant era: Sunset Seafood and Pasta moved in in 1987, followed by L.A. Wings in 1992 and Willy's in 1993. Vittoria Trattoria took up residence two years later, and remained a market mainstay until Friday's fire. Throughout, 35 William St. has perfectly reflected not just the changing tastes, but also the changing face of the city. "It stands as an excellent example of the … creative reuse of commercial establishments, [and] it stands as a testament to the change of the … ethno-cultural makeup over time," Henry said.